Windy City Playhouse presents SOUTHERN GOTHIC. 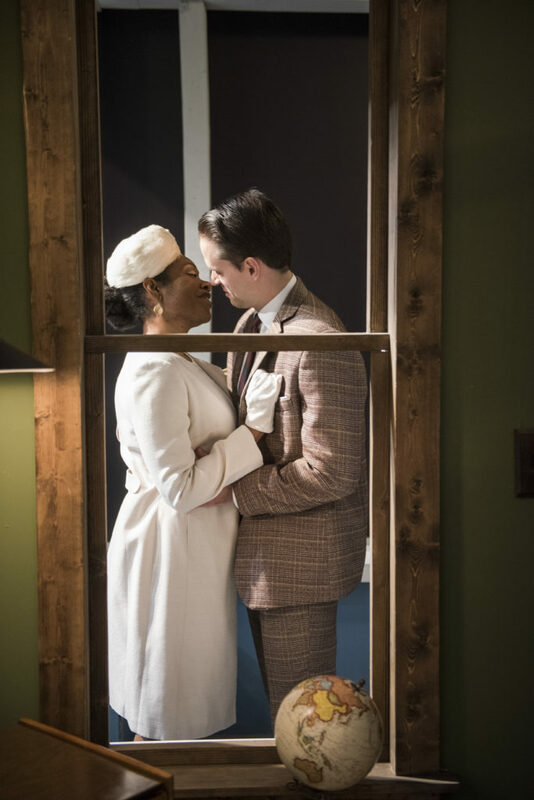 WCP debuted its immersive theatre experience in 2018 at its main theatre. Following a wildly successful initial run and multiple extensions, SOUTHERN GOTHIC has been moved to a new location to satisfy an ongoing demand for tickets. After having to cancel reviewing the show last May, I was delighted to get another opportunity to experience SOUTHERN GOTHIC at its new home. 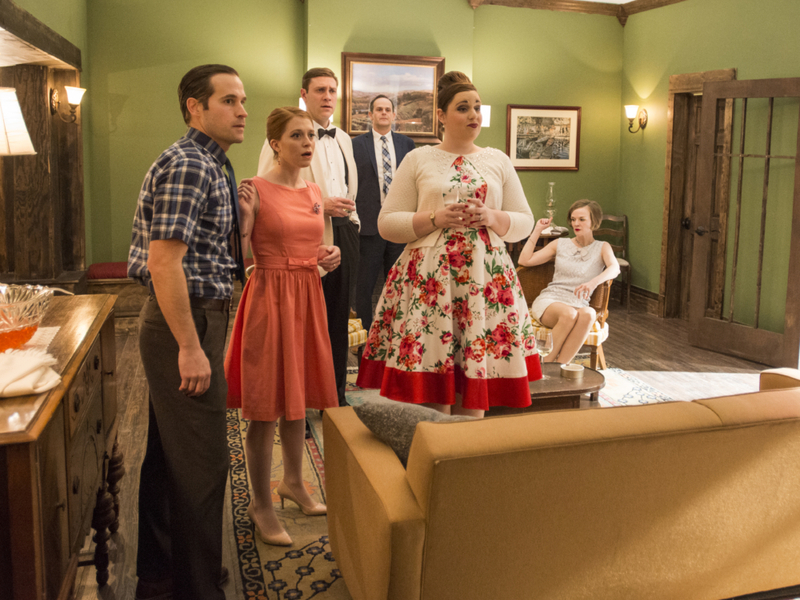 Scenic Designer Scott Davis reconstructed his house inside an office building. Upon arrival, we walk down a long corridor and open a door to a backyard. The ivy covered walls and patio furniture add to the indoor-outdoor illusion. The house itself has three main rooms: living room**, dining room, and kitchen. It’s not a theatrical facade of a house. It’s a house with four walls and doors. Davis’ home is pretty impressive. After the house manager reviews the ‘house’ rules, the audience is invited to enter the house. We are the invisible and silent guests at a birthday party. This isn’t an interactive show. The actors will not even acknowledge our presence. We are like ghosts haunting this house. 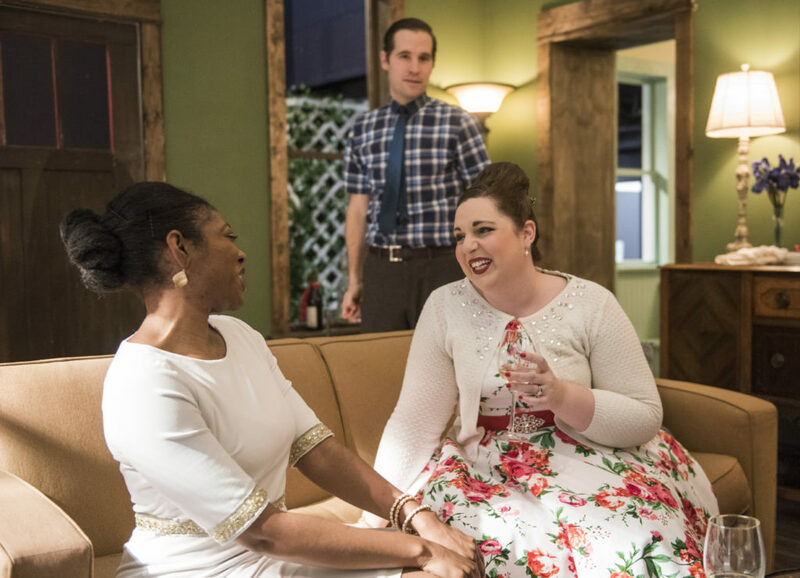 The team of Carl Menninger and Amy Rubenstein (co-creators), Leslie Liautaud (playwright) and David H. Bell (director) combine forces to make this house party a hot mess. As the liquor and gossip flow, secrets spill and implode all over the place. The action never stops. It continues in all the rooms, all the time. It’s life in surround sound! 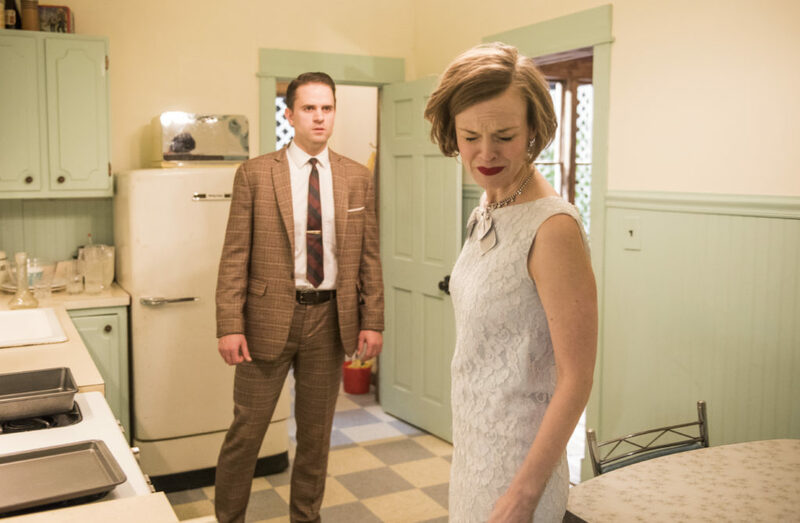 The drama unraveling runs the spectrum of 1961 taboo issues: alcoholism, domestic violence, racism, adultery, drugs, politics, embezzling, interracial canoodling, henpecking, growing up poor and the perils of having a late caterer. 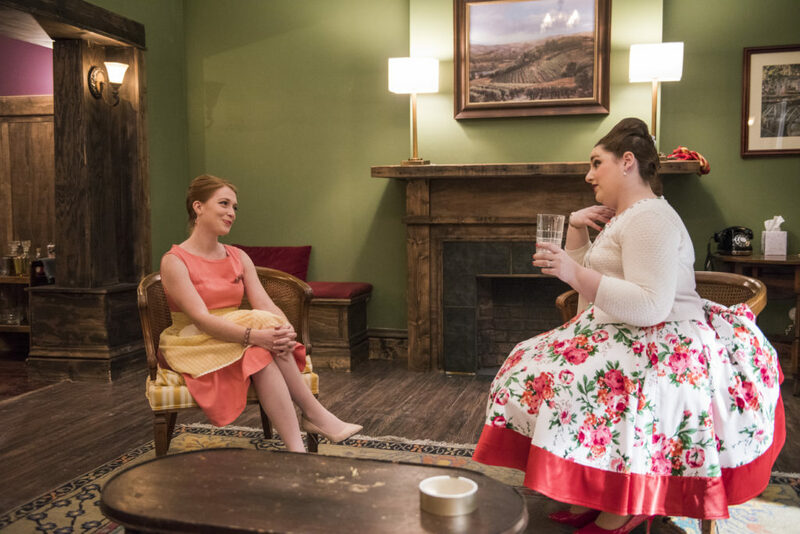 The drama riddled with comedy is a stylish, boozy soap opera. The terrific ensemble is a group of 39-somethings: Sarah Grant (Ellie), Michael McKeough (Beau), Amy Malcom (Suzanne), Paul Fagen (Jackson), Erin Barlow (Lauren), Victor Holstein (Charles), Arielle Leverett (Cassie), Ben Page (Tucker). More than half of them share a privileged and spoiled childhood. The others are determined to level up. The relational dynamics is transfixing. As the intensity of the interactions escalate, so does our fascination with these flawed characters. The domineering Malcom continually tries to manipulate others into submission. Whether she is berating Fagen (her husband), flirting with Holstein (potential employer for hubby) or telling embarrassing stories about Barlow (childhood friend), she delivers her barbs with a chuckle. Holstein charms everyone in the room but Barlow (his wife). And she retaliates by getting hammered. The elegantly sloshed Barlow then brings out her perfectly manicured claws to belittle Leverett and confront Grant. This house is under the influence. And all these people are being judged for the past and present indiscretions. No one will leave unscathed. SOUTHERN GOTHIC is a totally original theatrical experience. It’s immersive without being interactive. It’s dramatic while being funny. And it’s like life. It’s not just one conversation and one problem. SOUTHERN GOTHIC is a houseful of enough muckrakers and scandals to blow the roof off. *A sample of three drinks (gin & tonic, champagne, whiskey sour) will be served throughout the show. It amounts to one drink. A functioning bar on the patio will provide beverages or snacks throughout the show. Drink tickets must be purchased before the show. **Benches line the house interior. Although you can go into any room at any time to observe the interactions, I enjoyed my perch between the living room and the patio. I was front row for drama in these areas. Plus, I could see and hear partial activity in the dining room and bathroom.